Here is the Kindle review as I promised last week. The Kindle in review (featured above) belongs to my buddy Aki, who got it ordered from the US. 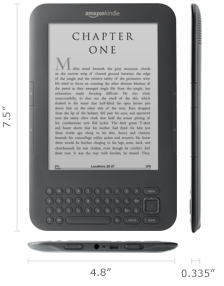 The device is a basic model with wi-fi listed in the Amazon website as Kindle Wi-Fi. I had a look around at the device and it appears quite a bundle for a bibliograph. The screen is big enough to have a decent read. The battery life is impressive. The reader supports native pdf format making porting your books to kindle easier. While the e-ink technology delivers crisp and easy to read fonts, the toggle buttons on the side of the device allows for easy navigation through the pages. It automatically detects nearby Wi-Fi networks when enabled. Once you have installed a Wi-Fi Network Kindle will automatically connect to that network the next time you are near to the hot spot. The device has the capability to hold more than 3500+ books. Considering that an avid reader can go through a book in 2 days that’s more than 17-20 years worth of books that you carry around you. May I remind you in 8.5 ounces only? Impressive eh? Having trouble understanding a word or reference in the book, wait no more to resolve it, the built-in dictionary allows you instant look up. With so many good features in the device you might be wondering is there anything negative here?? This sounds too good to be true. Sorry to say there are a couple of flies in this ointment. That said about the PDF, the only format where the text wraps around the screen is Amazon's own AZW format, which means converting all the PDF's into this format before you have a easier time reading the content. It fit's in the palm of your hand As compared with a mouse Small & Compact reader. Amazon's 6" diagonal electronic paper display, optimized with proprietary waveform and font technology, 600 x 800 pixel resolution at 167 ppi, 16-level gray scale. 7.5" x 4.8" x 0.335" (190 mm x 123 mm x 8.5 mm). 4GB internal (approximately 3GB available for user content). A single charge lasts for up to a month with wireless off. Keep wireless always on and it lasts for up to 3 weeks. Battery life will vary based on wireless usage, such as shopping the Kindle Store, web browsing, and downloading content. Fully charges in approximately 4.5 hours via the included U.S. power adapter. Also supports charging from your computer via the included USB 2.0 cable. Supports public and private Wi-Fi networks or hotspots that use the 802.11b, 802.11g, or 802.11n (in b or g compatibility mode) standard with support for WEP, WPA and WPA2 security using password authentication; does not connect to WPA and WPA2 secured networks using 802.1X authentication methods; does not support connecting to ad-hoc (or peer-to-peer) Wi-Fi networks. USB 2.0 (micro-B connector) for connection to the Kindle U.S. power adapter or optionally to connect to a PC or Macintosh computer. 3.5 mm stereo audio jack, rear-mounted stereo speakers. U.S. power adapter (supports 110V-240V), USB 2.0 cable, and rechargeable battery. Quick Start Guide (included in box) [PDF]; Kindle User's Guide (pre-installed on device) [PDF]. Additional information in multiple languages available online.